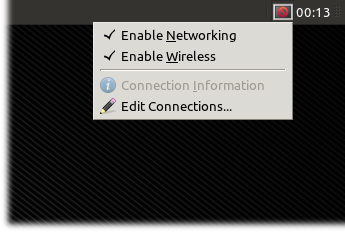 The network manager applet shows up in the bar with a broken icon and also doesn't list any of my ethernet or wireless devices. The network manager makes the connection, however, there is no possiblity to change connections between wired/wireless or more than one network card since these are not shown in network manager. I work on a Asus F7se notebook. Thanks, there indeed appears to be some issue with the libappindicator fallbacks. Please also make NM working with GNOME Panel 3 until indicators get ported (bug 781174). Same problem under fluxbox. Pls, fix it. Just as a note, this is a problem with the applet not displaying properly, not the network manager not being able to connect. For me at least, I can still connect to my wireless internet by entering the connection manually (used my information from my Natty install). The applet still doesn't list the connections at all (or its icon), but it's connected and I have wireless internet now in Oneiric. After the show made ​​a VPN (pptp) connections and icons in the Unity (Bug # 791 770), Network-manager stopped working in other DE/WM (fluxbox). (nm-applet:2792): Gtk-WARNING **: gtk_widget_size_allocate(): attempt to underallocate toplevel GtkTrayIcon 0x24e2070. Allocation is 12x12, but minimum required size is 48x48. (nm-applet:2792): Gtk-WARNING **: gtk_widget_size_allocate(): attempt to underallocate GtkTrayIcon's child GtkImage 0x21685b0. Allocation is 12x12, but minimum required size is 48x48. I believe this also affects the network manager icon that is rendered in the ubiquity panel. Yup, most likely does. I've found a way to workaround the issues here, so I'm working on finishing up testing an update that would be uploaded shortly. - rework, drop a lot of unnecessary changes. - turn the GtkStatusIcon back on. - use custom AppIndicator fallbacks to show/hide the GtkStatusIcon. In fluxbox nm-applet: "Enable Networking" is working, but does not save the mark is on. when will fix the problem with the item "Enable Networking" in fluxbox/openbox?